Product release announcements, company news, and helpful articles. Several months ago we opened a survey to gather feedback on our products and to help make a few decisions. I’d like to share the results of that survey with you and respond to a handful of the comments made. Question 1: Should we offer an installer for CCEnhancer? The result of this first question came as a bit of a surprise. Only one person had ever suggested offering an install-able edition CCEnhancer, so we assumed there was very little demand for such a thing. Following this result, we will be offering an installer with all future CCEnhancer releases. Question 2: Should System Ninja clean beta versions of web browsers? Neither option was able to attain a majority of votes, so we’re going to maintain the status quo. System Ninja will only clean stable versions of web browsers, but continue to allow users to manually add beta versions with the functions available under Options → Scan Inclusions. Question 3: Do you think JavaRa still has value and that development should re-commence? No surprises here. JavaRa has been deprecated for a couple of years now and the current JRE installer seems to be doing a solid job removing old versions. Development will not re-commence. There were two topics raised several time in the general feedback section that I’d like to address. This won’t happen. Offering free support and updates into perpetuity is not a sustainable business model. Our subscription model provides us with a consistent flow of revenue so we can continue to invest in product improvements and sustain our support efforts. 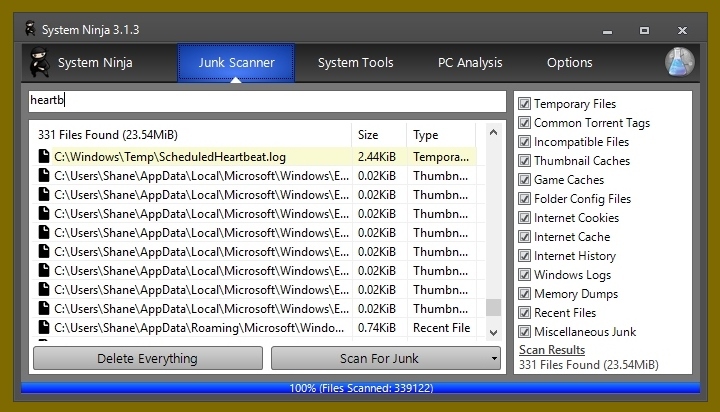 The security improvements in Windows 10 made it necessary to unblock portable executable files or programs contained in .zip files. We tried providing instructions, but a substantial number of users didn’t read or understand them and this became a significant support burden. We made the decision to only offer portable System Ninja to Pro Club members. Free users can still roll their own portable System Ninja edition by copying all of the files in C:\Program Files (x86)\System Ninja to a new folder and deleting the uninstaller’s executables. No comments. Posted November 24, 2017 in Announcements. System Ninja 3.1.9 is a minor maintenance release that includes a small number of bug fixes, feature improvements and localization updates. Added back button to DuplicateFinder options page. DuplicateFinder MD5 check is no longer case sensitive. Updated Spanish and Russian localizations. The list of running processes can now be saved to a text file. The “save to text” feature now supports saving more than three columns. Detection of obsolete Google Chrome versions has been removed*. You can download System Ninja from its usual page. Pro Club members will receive this update automatically next time System Ninja is run. No comments. Posted October 29, 2017 in Releases. No comments. Posted October 1, 2017 in Announcements. 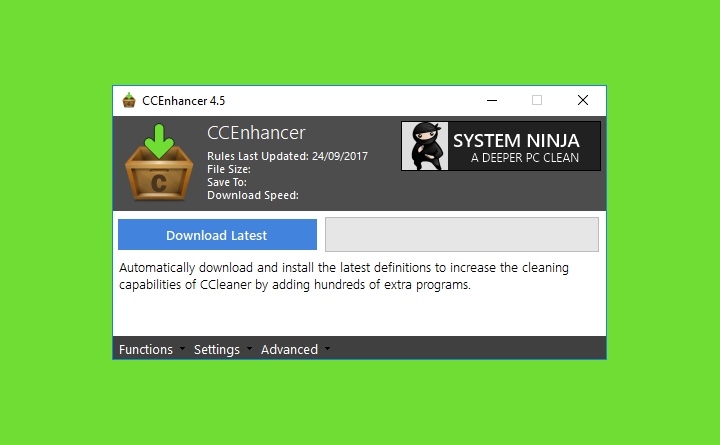 A misleading error message was being shown to a small subset of users when they used CCEnhancer 4.5. This minor release fixes this issue and also updates the Russian and Greek localizations. The update is available from the CCEnhancer download page. No comments. Posted in Releases. CCEnhancer 4.5 is CCEnhancer’s first significant update in (almost exactly) three years. We’ve updated the user interface, fixed lots of bugs, added some handy features, and performed some necessary security hardening. 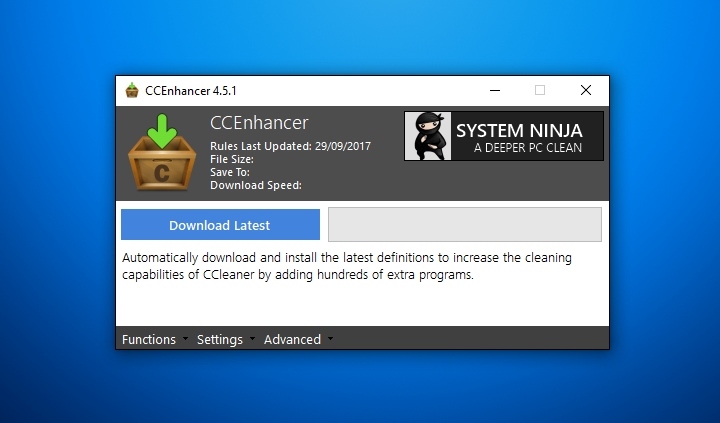 The latest version of CCEnhancer can be downloaded from its usual download page. CCEnhancer now requires the Microsoft .NET Framework 4.0 or newer (instead of 3.5) to be installed. This change is to maintain consistency with other SingularLabs products. *Users running outdated operating systems that don’t support Server Name Indication (SNI), such as Windows XP, may need to use the ‘Use alternative download URL‘ option from the Advanced menu. No comments. Posted September 24, 2017 in Releases. We’re proud to announce that Bzzt! 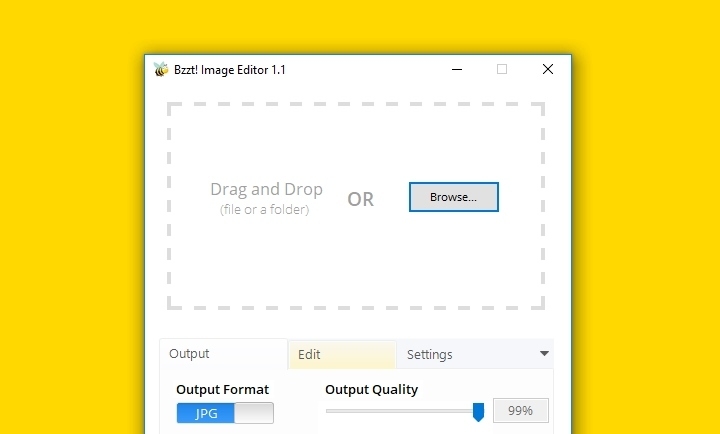 Image Editor 1.1 is now available for download. This update includes image processing improvements and better support for localizations. You can download the latest version from the Bzzt! Image Editor product page. Users of previous versions will receive an update available notification over the next few days. No comments. Posted September 21, 2017 in Releases. System Ninja 3.1.8 is now available! This release focuses on improving the experience of our non-English-speaking users and refining our Duplicate Finder tool. You can download the latest version of System Ninja from it’s official homepage. If you’re a Pro Club member, System Ninja will automatically update next time you use it. No comments. Posted August 5, 2017 in Releases. 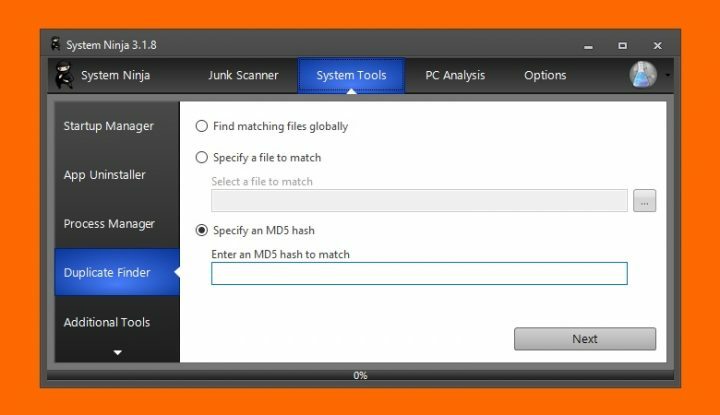 Need to find out whether a particular file or folder is being cleaned, or confirm that an important file hasn’t been inadvertently detected? 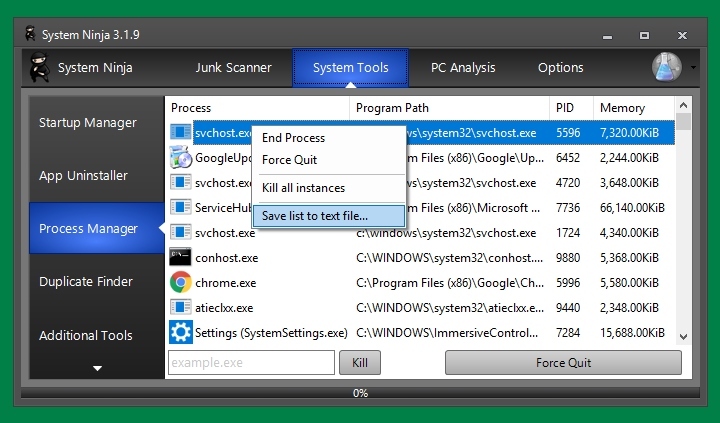 System Ninja has a built-in search function hidden behind a keyboard shortcut. Once a scan has finished, you can toggle the search box by pressing CTRL+F. File paths that contain your search input are highlighted and automatically moved the top of the list. The results update in real-time as you type and it can sort through thousands of files within a fraction of a second. No comments. Posted July 26, 2017 in Tips & Tutorials. No more betas; this is the stable release of Bzzt! 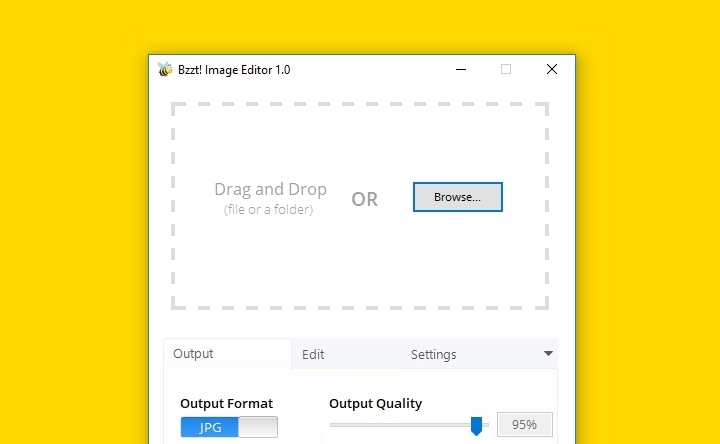 Image Editor. We’re pretty excited for Bzzt! to finally be released, especially since it’s been a work-in-progress (intermittently) for over two years. The stable release is largely the same as the previous beta, but we’ve added a handful of bug fixes, two localisations, and two new features. Added option to skip resizing if the original image is already smaller than the output size. Bzzt! 1.0 can be downloaded from here. If you have any questions or run into any problems don’t hesitate to drop into our support forum for help. No comments. Posted July 22, 2017 in Releases. Windows 10 will block the execution of some program files if they’ve been extracted from a .zip file without first being unblocked. This issue affects several of our products, including System Ninja Portable, CCEnhancer Multilingual Edition, and various System Ninja plugins. To fix this problem, perform the following steps. 1: Right-click on the downloaded .zip file and select Properties. No comments. Posted July 19, 2017 in Tips & Tutorials.